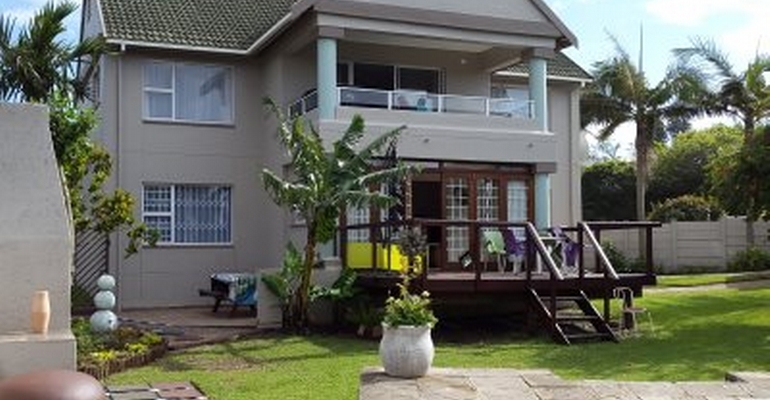 Jardim Do Mar consists of two 6 sleeper, self catering units just 350m from St Michael's, Uvongo and the popular Orange Rock Beaches on the KZN South Coast. (Both in safe walking distance). The property consists of an upper level unit, and garden level unit, both of which have 2 bedrooms and sleep 6 people. Both units have fully equipped kitchens and 2 bathrooms each, which include linen and bath towels. The full house sleeps a total of 12 - 8 adults & 4 kids, or 10 adults & 2 kids. Both units have everything needed for a self catering holiday, and the upper level veranda has spectacular sea views. There is a splash pool on the property and communal braai facilities for your enjoyment. Both units have private entrances, ideal for a friends vacation or extented family. The premises is fully walled with a safe garden area, for the kids to play around the pool. It is walking distance to restaurants, pubs and shops. Private Entrance to each unit, and to pool & garden area. Wooden Deck on garden level unit. CONTACT US FOR OUR OUT OF SEASON RATES FROM R850.00 PER UNIT PER NIGHT. UNITS SLEEPS 4 ADULTS 2 CHILDREN. or 2 ADULTS 4 CHILDREN MAX - PER UNIT.